When I first took up motorcycling I was frightened of getting hit by other drivers, many of whom either didn’t see me, or didn’t feel they needed to yield to a motorcycle. I even had nervy drivers turning right toward me and grinning. I installed a louder horn, to better warn others of my presence, and added extra reflectors and lights to make myself more conspicuous. But as the years rolled by, I gradually learned to negotiate traffic with much less angst, and far fewer close calls. Here are some secrets I’ve learned. 1. Ride like you’re invisible. You may have heard somewhere that making yourself more conspicuous will cause other drivers to stay out of your way, say by running with your headlight on high beam, or having loud pipes. But there is really nothing you can do to cause another driver to avoid you. Lots of drivers are prejudiced against motorcycles. Worse yet, about half of the drivers around you will not comprehend your presence, regardless of how bright or loud you are. It’s not a bad idea to wear bright colored gear, but your most important job as a motorcyclist to take the initiative to get out of the way regardless of who is right or wrong. Fortunately, you only need to avoid those drivers who are pointed in your direction. 2. Learn to predict what’s about to happen. To avoid collisions, you must comprehend what’s happening, and predict what’s likely to occur over the next few seconds. Yes, you need to scan the situation ahead as far as you can see details. Cast your focus way out, and reel it back in, like a fly fisherman. Don’t ignore side streets and alleyways ahead, as well as traffic behind you. Intersections are obvious danger zones, but alleyways and parking lot exits are also intersections, where car/bike collisions are more likely to result in serious injury to the rider. It may be politically incorrect to single out other drivers based on appearance or age, but the driver of a poorly maintained vehicle is probably less interested in avoiding a motorcycle than in fixing that broken mirror or burned-out turn signal. A driver using a cell phone is about as dangerous as a drunk driver. 3. Learn what trouble looks like. 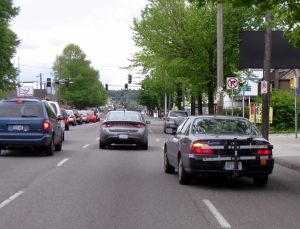 There are lots of traffic hazards that repeat over and over again, such as left-turning cars, and drivers turning right without stopping, or changing lanes suddenly without looking or signaling. Study traffic, and eventually you will be able to predict what other drives are about to do, based on subtle clues. For example, the first clue that a vehicle is starting to move is the top of the front tire. While you’re studying other drivers, don’t forget to scrutinize the road surface for motorcycle-specific hazards such as raised edges, slippery arrows, and steel construction plates. You may find it helpful to study books such as Proficient Motorcycling during the off season, to become smarter about traffic and surface hazards. 4. Ride at the speed of traffic. 5. Stay out from behind large vehicles. Avoid following directly behind a truck or bus, where you would be hidden from view. 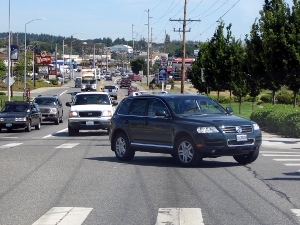 If you enter an intersection following a big vehicle, other drivers ahead won’t be able to see you, even if they aren’t distracted. If you are trapped behind a large vehicle, drop back several seconds to open up the view, and give other drivers a better chance to see you. 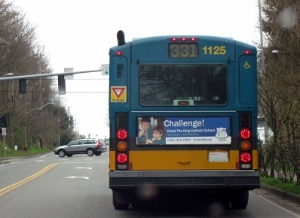 Remember, that in some areas transit buses have the right of way when pulling back into traffic. Give commercial trucks a wide berth. Not only is it difficult for the driver to see you, he or she may be distracted by looking for a delivery address, and need to make a sudden turnoff. When you are approaching a situation where a collision is possible, ease on the brakes to reduce speed and allow a quicker slowdown or stop. Slowing 10 mph from typical street speed not only gives you more time to react, but chops your braking distance almost in half. When you suddenly realize a collision is imminent, it takes time to react, and it wastes time having to reach for the lever. To reduce reaction time, cover the front brake lever. That is, when you are entering a situation where a quick slowdown might be needed, ride with two or more fingers over the brake lever. Learn to control both the throttle and brake with one hand, and transition smoothly between them. The author and Sound RIDER! are willing to grant permission to reprint this column at no charge for educational purposes by clubs and non-profit organizations including the military. Contact sreditor@soundrider.com for more details, full size photos and a full transcript of this article.